by Mechanical Temp LLC’s certified technicians. 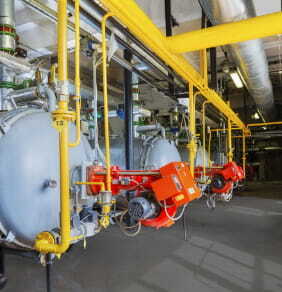 Keep your building compliant with annual boiler inspections from Mechanical Temp! If your commercial or industrial business has a boiler, by law it must be inspected annually. This keeps your employees safe, your boiler working efficiently, and your costs low! However, not just any company can inspect a boiler; they must be CSD-1 certified. At Mechanical Temp, we have a team of technicians who exclusively service boilers and are certified in inspecting them. Our technicians have been servicing boilers for over a decade and are knowledgeable of all of their components. We continue to further our education of commercial boiler repairs, maintenance, and inspections to ensure we can serve you with the highest degree of quality craftsmanship. Boilers are older machines, which means that repairs are best left to the certified experts at Mechanical Temp. When your boiler stops working, you can rely on our 24/7 emergency service to return the heat back to your commercial building. Our team’s commercial boiler repairs are fast yet efficient, never compromising the quality of work to move onto the next job. All of our work is done by certified professionals who know and understand the complex inner workings of boiler systems, so each repair is built to last. Replacing or installing a new boiler takes a trained eye; don’t take a chance on a company just for a cheaper price! Upon learning about your building’s specific needs, we work with you to customize an effective boiler solution that will add great value to your business. We work with leading boiler manufacturers that allow us to offer quality equipment at exceptional prices. We stand by our brands because they last the test of time and are made with quality materials, reducing the risk of machine breakdowns and downtime in your building. It’s time to request a new HVAC/R solution. Contact Mechanical Temp today for boiler repairs, maintenance, and installations!